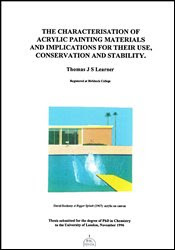 Thomas J. S. Learner, The Characterisation of Acrylic Painting Materials and Implications for Their Use, Conservation and Stability, London, University of London, 1996. Está aqui. O acesso é livre, mas implica registo prévio. Analytical methods were investigated for the characterisation of acrylic painting materials. For this, the salient chemical features of modem paints and varnishes based on acrylic resins and, for comparison, the other main classes of resin used were outlined. Appropriate analytical techniques were then developed to enable the detection of these painting materials on works of art. Although emphasis was placed on the binding media, other paint components were also considered, such as the pigments, extenders and additives. The main analytical techniques used were pyrolysis-gas chromatography-mass spectrometry (Py-GC-MS), Fourier Transform infrared spectroscopy (FTIR) and direct temperature-resolved mass spectrometry (DTMS). For each, results were given for standard samples of acrylic paints and varnishes, other classes of binding media, various pigments and/or extenders and paint fragments taken from actual works of art. All three techniques were able to detect most of the major types of binder. Py-GC-MS offered good separating power for complicated mixtures and the ability to detect azo pigments; FTIR spectra were seen to contain components from the binder, pigment and extender, which could often be separated visually and identified; DTMS could also detect all types of organic and even some inorganic pigments. Other techniques, such as energy dispersive X-ray analysis (EDX) and thermogravimetric analysis (TGA) assisted with quantitative work. In addition, Py-GC-MS and FTIR were used on artificially aged paint samples to study the validity of these techniques on older paint samples and to investigate the stability of acrylic paints and varnishes in comparison to other classes of binder. The pyrograms and spectra of the aged acrylic paints were unaltered from those of the unaged samples, as were preliminary measurements on their colour and glass transition temperatures. Based on these observations, implications were discussed for the use, conservation and stability of acrylic painting materials.